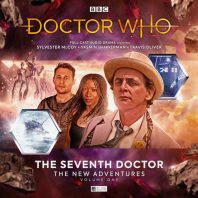 The first volume of The Seventh Doctor New Adventures draws to a close with Tim Foley’s ‘The Dread of Night’ as the Doctor, Chris, and Roz seek shelter from the elements within a grieving household. Grief is not the only emotion running high, however, as a sinister force plagues the inhabitants and draws established truths squarely into question. Under the guise of being passing travelers from afar, the Doctor and his companions soon find themselves entwined in the personal story of Isabel who faces the prospect of losing a second loved in short order as her sister Annabel’s condition continues to worsen despite Nurse Hooley’s best attempts. Yet amidst the palpable sorrow and anguish as Annabel’s physical and mental health decline, mysterious goings-on draw the occupants’ attention while primal fears are brought to the forefront. With inexplicable events such as furniture being moved in rooms that have not been touched in years and an unused tea set suddenly turning scalding hot, nothing can be taken for granted and nobody is above suspicion with Annabel’s delusional whisper of the name of her imaginary friend Sandy and her innumerable drawings of a horrifying amalgamation of creatures the only discernible leads. The more ominous tones that Sylvester McCoy is capable of make his incarnation a perfect match for more horror-laden environments, and he wonderfully rises to the occasion to enhance an incredibly tense and unsettling atmosphere brought to life with a vast array of evocative sound effects. The Seventh Doctor of the novelised The New Adventures range quickly solidified the more manipulative reputation that he had started to build towards the end of his televised run, and though he is not pulling the strings to put events in motion here as he became so prone to doing, the Doctor on display here is very much portrayed as being several steps ahead of everyone else while playing for time until just the right moment to expose the truth behind a threat that is anything but imaginary and so closely linked to both Annabel and Isabel in wholly distinct manners. Indeed, with a small cast that becomes smaller as events become ever more deadly, Foley pulls off the impressive trick of subverting expectations and offering a genuinely surprising resolution fronted by an utterly superb reveal. Although the fallout is left a bit ambiguous given the destabilisation of assumed truths and the force’s sudden power to truly manifest, the fashion by which the Doctor explains the truth given the clues that have been seamlessly integrated without undue attention into the script is fantastic. In fact, it’s hard to imagine any other resolution than the one presented having quite so much impact, but- following a trend for this set- the resolution is a bit too easy and rushed given the immense work that goes into crafting the needed atmosphere and emotion for the climax to resonate as powerfully as it does. In many aspects, a horror-laden mystery is the perfect genre for the audio medium, and every aspect of the production shines to viscerally bring ‘The Dread of the Night’ to life. With immense performances and the relationships among the leads encapsulating how comfortable with and trusting of each other their characters are at this point in time, this story culminates a strong progression of this trio and again sets the bar high for the assured continuation of this new look into a bygone era of prose that was once so vital to the lasting legacy of Doctor Who.